This album, and indeed the group, are virtually impossible to categorise. Released in early 1979, as punk was still around and post-punk was all over the place. This sounds by its name cover and general image as if it were a post-punk record, but it was not. It was nothing like Public Image Ltd, Magazine, Joy Division or Echo & The Bunnymen. In fact, I can honestly say I don't what they were, or what the album is/was. 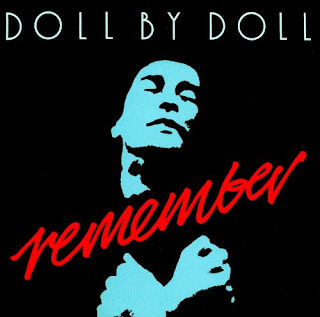 Doll By Doll were a band formed in London in 1977, but fronted by charismatic and highly perceptive, intelligent Dundonian front man Jackie Leven. They had the inscrutable, enigmatic lyrics of the post-punkers, and the somewhat dull image. The music, however, was another story. It was crammed full of effervescent guitars. Guitar riffs, guitar solos, pulsating, muscular drums all topped off by Leven's dominant, commanding and often extremely moving voice. "Butcher Boy" is an odd track - anthemic in parts, with some captivating vocal parts and stirring guitar. It careers around all over the place, rendering it, as I said earlier, impossible to pigeonhole. "Chances" highlights Leven's rock'n'roll-styled voice, some deep tuneful bits and some falsetto, some female backing vocals and an infectious drum, bass and guitar backing. Part post-punk, part early Roxy Music, part punk, part heavy rock, part rock'n'roll. In many ways the band are rather like early Roxy Music, you just did not know what to make of them. Within the same track there was over-the-top rock'n'roll romanticism and post-punk dour introspection. Quite bizarre. Then a huge heavy rock guitar passage breaks out in a huge cacophony. They certainly were inventive. "Sleeping Partners" is an excellent, upbeat rocking, new wave-style number with echoes of Elvis Costello in it and some noir lyrics. There are touches of Joe Jackson cropping up too in the song's adventurous seven minutes. Then at the end, the guitar is so Siouxsie & The Banshees. The vocal goes all Public Image Ltd. These songs really do merit repeated listens. So much is happening. "More Than Human" starts with a Talking Heads "Psycho Killer" sort of feel to it in its rumbling, menacing intro. When Leven and the rest of the band kick in there is real rock majesty to it and some quirky David Byrne-influenced vocal delivery. "Lose Myself" is a more conventional late-seventies-style rocker. Nice solid bass on it and a bit of post punk bass/drum interplay. "Janice" is a beautiful song with a vibrato-style, moving vocal from Leven. It is almost an absolute classic. Yes, it doesn't quite get there, none of the album does, but it doesn't die wondering. There are moments in this song when you just think "wow" and are really moved. It is a rarely-mentioned gem and certainly worth checking out. It has airs of some of Billy Bragg's later songs in it. I am sure he knows this album. You can just hear it. Lyrically, there is a lot of The Beautiful South in there too. "The Palace Of Love" is a seven minute Siouxsie-influenced concoction that begins with a mysterious, industrial bass and choppy guitar intro and some heavy rock hooks and vocals. Again, it is just completely impossible to categorise. Another one deserving several listens. This really is a raw, uncut challenging album that is worthy of some of anyone's attention. Such a shame nobody really remembers Doll By Doll these days. They deserved better.